The Gunners are expected to complete a double signing before the transfer window closes. Mustafi is expected to sign in the coming days. ARSENE WENGER DENIED Arsenal’s expected signings are panic buys as he gets set to welcome Lucas Perez and Shkodran Mustafi to the Emirates Stadium. Arsenal are expected to spend around €61 million to sign Perez and Mustafi from Deportivo La Coruna and Valencia respectively in the coming days. However, despite his reluctance to spend big in the past, and considering the timing of the purchases, Wenger insists he does not panic buy. “Look at my face, is it the face of somebody who does a panic buy?” Wenger asked. “No. I try to make the decision. “I have to make the right decision, knowing that it is not easy. What we spoke about many times, you are not the only one who decides about the timing. “My job is to resist stress and pressure, while keeping my head in the blue, just what is right. Focus in life is on one thing. When asked if it worries him to spend a lot, Wenger said: “No. I always told you it’s not a question of numbers. It’s do you have the money to spend it? That is the first [question]. “And after, do you make sure that you spend it well? And I think when I told you the transfer is linked of course with talent, the expected strength, but as well with resale. 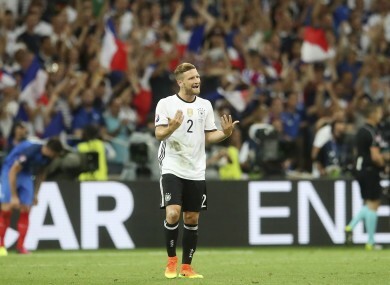 Email “Arsene Wenger insists €61 million signings Perez and Mustafi are not panic buys”. Feedback on “Arsene Wenger insists €61 million signings Perez and Mustafi are not panic buys”.